These gluten free corn dogs are the perfect low carb corn dogs that do not actually use cornmeal and that can also be made dairy free without any problems! Low carb corn dogs have been something I have been wanting to try making for a long time. 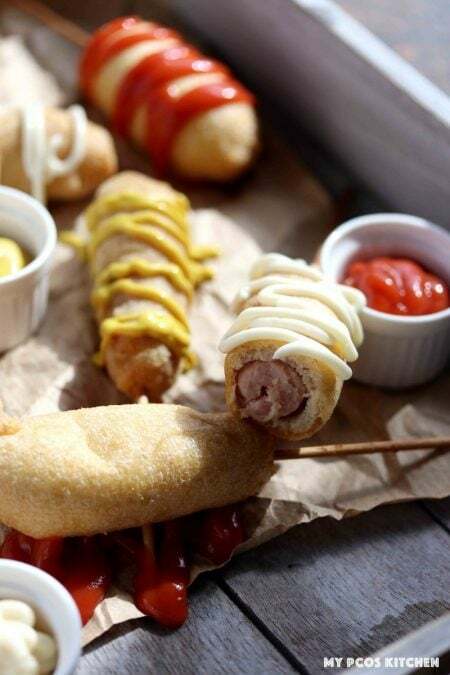 I always imagined that if you wanted to eat gluten free corn dogs on a low carb diet, you would need to stick to fathead pigs in a blanket style of corn dogs and not have that deep fried version. When I uploaded my keto tempura recipe a while back, it never really occurred to me that I could try and play with that batter to try and make different dishes until a couple of weeks ago. I decided to take the batter and change it up a little to see if it would work for low carb corn dogs. My first attempt led to a batter that would stick to the sausages, but it was way too airy and flaky to be called corn dogs. Other than that, I used the same ingredients that I had used for the tempura batter. Make sure to use sparkling water as flat water will not give you the same effect. For dipping sauces, my personal favourite has always been mayonnaise. For some reason, my friends and family all think I’m weird for not using ketchup or mustard, but corn dogs for me have always best tasted with mayonnaise! Even better when you use your own homemade one! 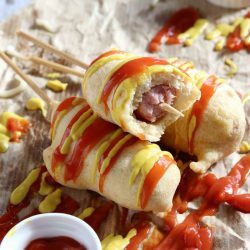 I actually tried making this corn dog recipe without cornmeal at first and then compared it to another version with a couple of tablespoons of cornmeal just to see if there would be a major taste differences. You know what, you couldn’t even tell cornmeal was in the batter, and the batter without it tasted just as good so I decided to avoid adding it. 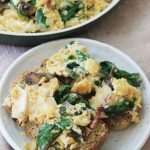 You really don’t need to add cornmeal, especially if you’re eating low carb or keto, as you’ll get the same results with almond flour. 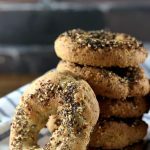 Almond flour has that sort of grittiness to it that kind of resembles cornmeal which is why I think my gluten free corn dogs taste very close to the originals. For the dairy free folks, don’t worry, I have you covered! 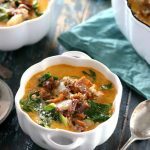 I always try to give an alternative in my recipes as many of my readers are dairy free. To make dairy free corn dogs, you will need to substitute the whey protein powder for egg white protein powder. The results are a little similar in taste, but texture wise is a little different than the ones with whey. When buying egg white protein powder, make sure you use powder that only has egg whites in it. There are many kinds of protein powder that tend to add different additives and what not that may not be suitable for low carb diets. I like to use the one from NOW and that’s the one that I use to coat my chicken in my dairy free low carb fried chicken recipe and my sweet chili chicken recipe. You’ll notice that the batter is slightly thicker with egg white powder and there will be a bit of flour bumps when you coat your sausage. However, when it deep fries, the flour bumps will disappear. When using egg white powder, I noticed that the batter turned out more puffy and dense than when using whey. I also noticed that egg white powder tends to be lumpy when mixed with different ingredients, so it’s very important for you to whisk the batter real good to get rid of all the ”flour” bumps in the batter. They also come out way thicker than the whey protein ones so they are more doughy. 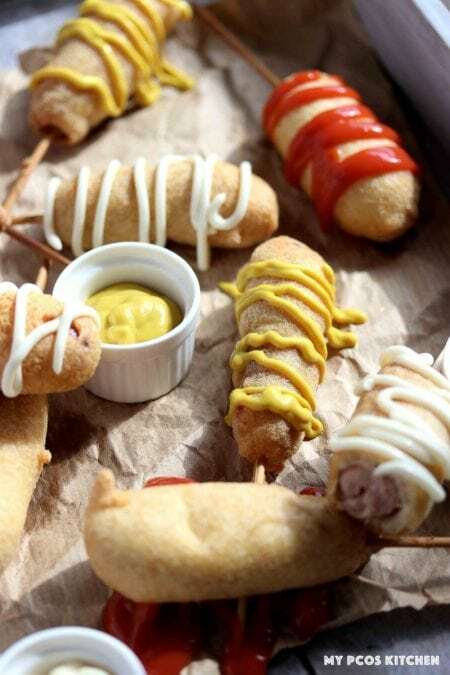 The batter might not be totally even as some parts will be more bubbly and there may be extra parts of the dairy free corn dogs that pop out when deep fried, but either way they are amazing! I also had to up the sparkling water a tad bit because the batter was way too thick with just one tablespoon of it. 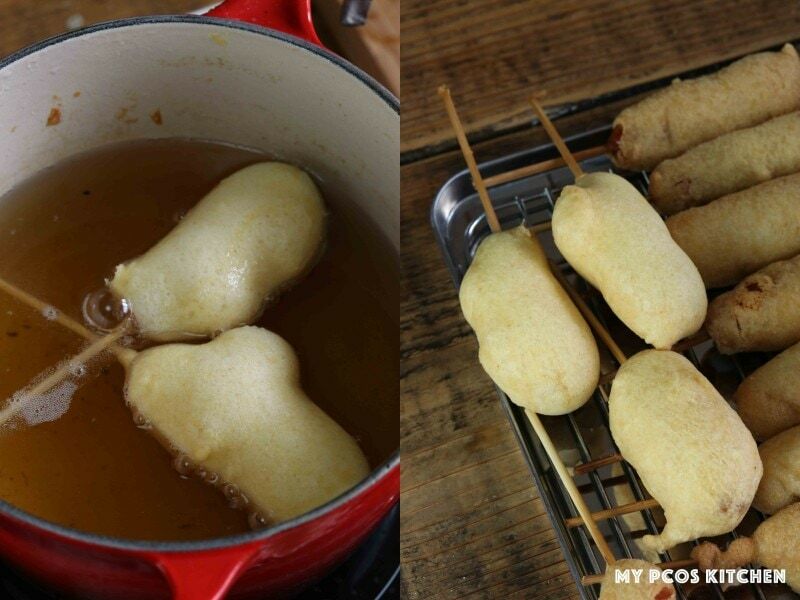 Here are a few tips to follow when making my gluten free corn dogs. 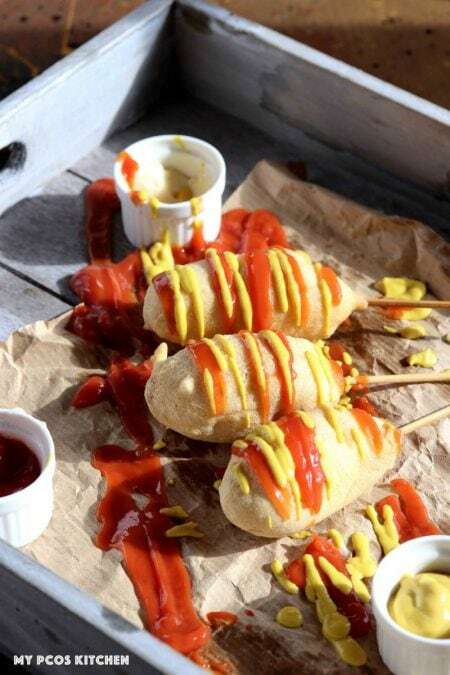 You’ll want to whisk the batter really nicely for both dairy and dairy free versions of this gluten corn dogs recipe. Don’t skip the sparkling water, you need it. You also need either xanthan gum or guar gum. This recipe won7t work without them. 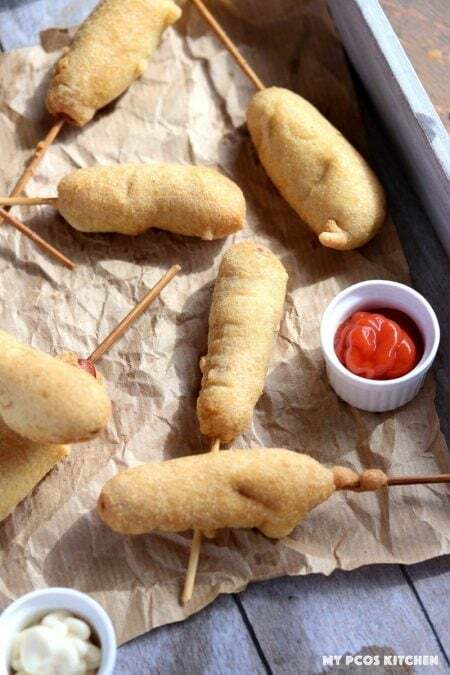 The corn dogs will float to the top of the oil and will not want to flip over, so you’ll need to use tongs to turn the dogs around and hold them still so that both sides can cook evenly. This is why I recommend only frying one or two at a time so that you have enough time to hold the low carb corn dogs down to cook. You can use small or big sausages, just make sure you have a pot big enough to hold all of your oil. I personally used lard so I just used a small pot with small sausages. Use wood skewers and pierce the top of your sausage all the way to the bottom as straight as you can. If you pierce it crooked, the corn dog will cook bent. 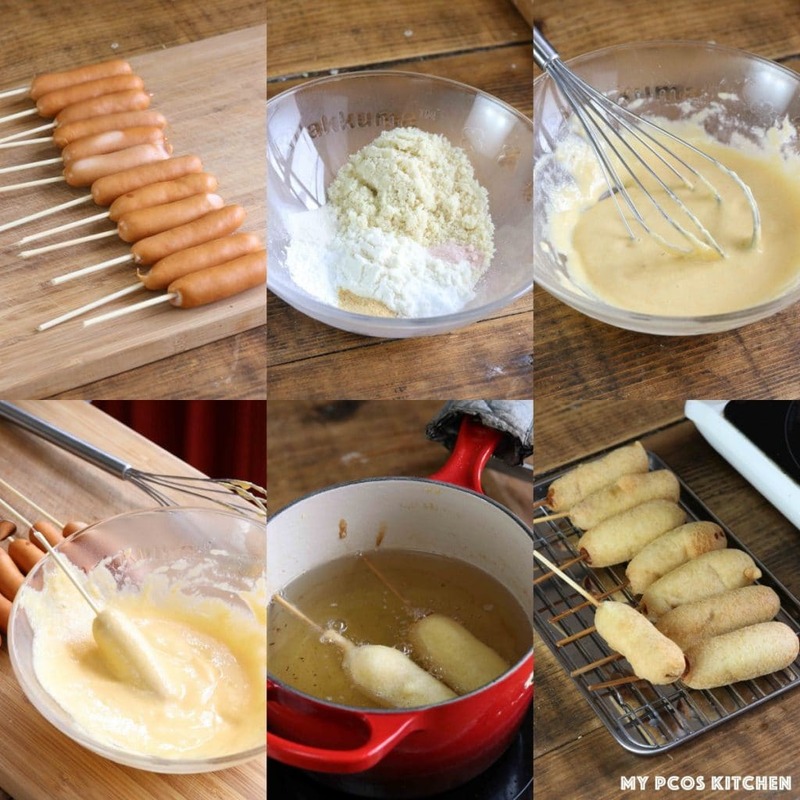 Now that you know how to make gluten free corn dogs, when are you holding your next party? Summer is coming up so it’s not too late to start! Delicious low carb corn dogs that can also be dairy free! Pierce the wood skewers into your sausages all the way to the tip. Heat the oil in a pot at 140C-150C/285F-300F. 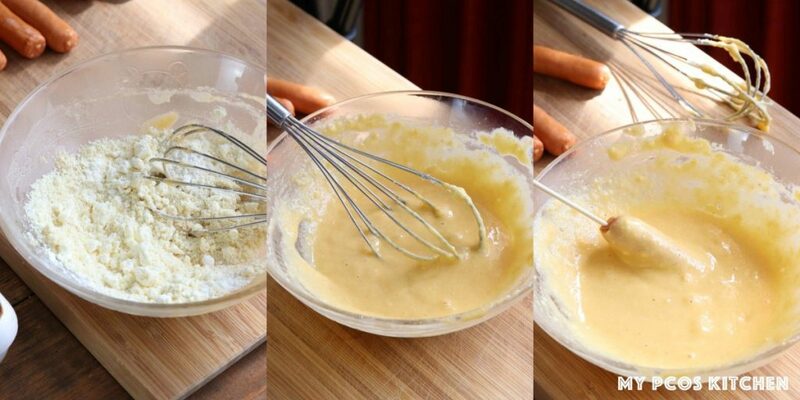 In a bowl, add all of the dry ingredients for the corn dogs and whisk together. Crack the egg in and drizzle in the sparkling water. Whisk the batter really good, especially for the dairy free version as the egg whites tend to clump together and create flour bumps. 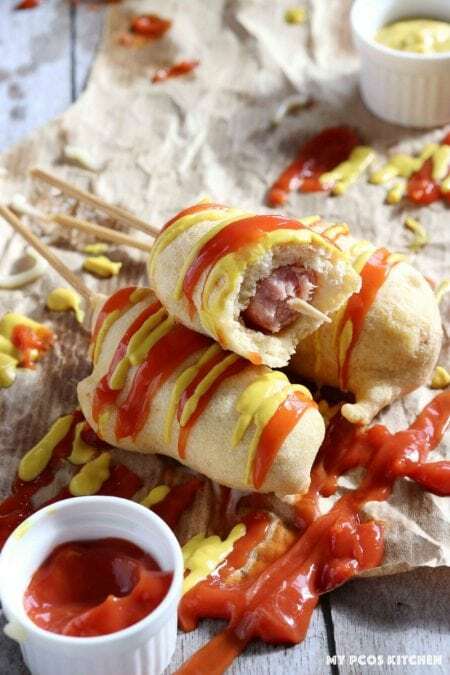 When the batter is nice and smooth, dip one sausage at a time and roll the skewer with your fingers so that the batter coats the sausage everywhere evenly. I suggest frying 1-2 corn dogs at a time and not more. Add the corn dog into the hot oil to fry. It should only take 30 seconds per side to cook. When you add the corn dog inside the oil, even if you flip them over to cook on the other side, they won't stay and flip back over. So you need to hold them still with tongs so that both sides can cook evenly. This is why I suggest only frying 2 at a time maximum. When both sides are nice and crispy and golden brown, take them out of the oil and let them cool down on a wire rack. Repeat for the rest of your sausages and your corn dogs are ready! They reheat well in the microwave, but since they are deep-fried they obviously taste better the same day. If you use hot dog sausages, you won't need to precook them. But if you use raw meat fresh sausages, you'll have to precook the sausages before deep frying them in the corn dog batter. The nutritional information is only for the corn dog batter. I made 12 mini corn dogs so the info is for the batter of one corn dog without the sausage. It does not include the sausages as depending on the brand you use, the nutritional info will be different. What kind of sausages did you use and were they GF. 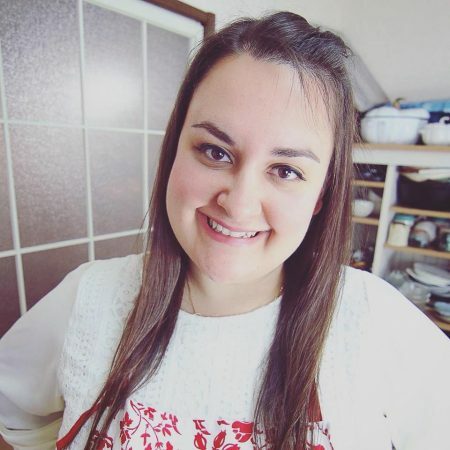 Hi Linda, I live in Japan so I used a Japanese kind and yes they were gluten free. I’ve never tried to use thongs to turn fried stuff, do you recommend ones with lace or just the standard cotton kind? Ooops, lol. As a French speaker, I always make mistakes with t/th words ahahaha. Fixed it.